In the show Chris tried a plastic oral device but found it too uncomfortable to wear and it kept coming in and out. In his words it was "absolutely horrible", "feels like a tennis ball in the mouth", "feel like going to suffocate". Chris then gets a Somnowell Chrome and reports "as easy at that (when puts in). Its not uncomfortable, fits perfectly, its been designed for my particular mouth, and I'd wholly recommend them to everyone. It makes a big difference on our whole lives basically, actually waking up feeling really good, Charlie feeling pretty good as well, and actually smiling". In this short 7 minute program Visiting Professor Simon Ash talks about the Somnowell Chrome and treats a patient. Two Consultant ENT Surgeons, Mr. Mike Dilkes and Mr. Sherif Habashi, also give their opinion of the Somnowell Chrome appliance. 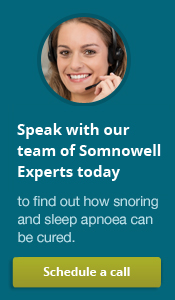 Dr. Chris Steele from the ITV "This Morning show" looks at the Somnowell Chrome appliance and other anti-snoring devices.